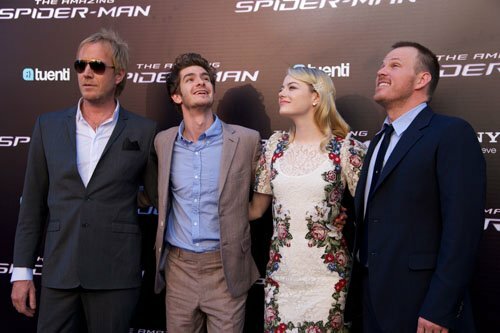 Emma Stone, Andrew Garfield and Rhys Ifans at the Spanish premiere of "The Amazing Spider-Man". Emma Stone, Andrew Garfield and Rhys Ifans at the Spanish premiere of "The Amazing Spider-Man". Wallpaper and background images in the Andrew Garfield and Emma Stone club tagged: stonefield emma stone andrew garfield the amazing spider-man movie premiere event 2012. This Andrew Garfield and Emma Stone photo contains suti biashara, biashara suti, nyayo, suti ya nguo, seti, seti ya nguo, suti mavazi, mavazi kamili, tailcoat, mkia kanzu, mikia, nyeupe tie, nyeupe tie na mikia, suti ya mavazi, mavazi ya kamili, kanzu ya mkia, tai nyeupe, and tai nyeupe na mikia. There might also be tatu kipande suti, bridesmaid, msichana wa heshima, mjakazi wa heshima, wamevaa vizuri mtu, suti, suruali nyayo, pantsuit, mtu wamevaa vizuri, and suti ya suruali.